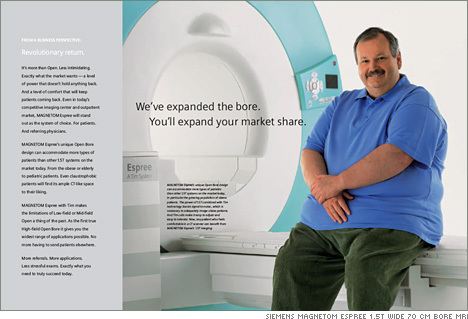 America is providing an increasingly expanding marketing niche for medical imaging companies – obese people. Today over 28% of Americans are considered obese which presents a challenge to manufacturers of imaging equipment in two interesting ways. First, excess fat blocks and diffuses penetrating x-rays so manufacturers faced with a challenge of getting clear enough images of plus-size patients. Thanks to Siemens, I don’t have to go to veterinary clinics for my MRI scans. This led Philips to develop “CT scanners that reduce X-ray doses in average-sized people by up to 70%.” — which means that at normal levels of radiation you can x-ray people 70% larger. This is a welcome development because patients are subjected to lower levels of harmful radiation. The second point of interest is that severely overweight people cannot fit inside diagnostic machines — leading Siemens to develop a larger MRI machine. As their ad notes, they’ve “expanded the bore” so their clients can expand market share. And if this study from the World Health Organization is correct, over half of Americans will be obese by 2030. Which is why Siemen’s, Philips and other imaging companies are doing what they are doing. Catering to their slowly but surely expanding American market.